Researchers believe that the chimpanzee is about four to five times stronger compared to humans. They have discovered the difference in muscle architecture between chimps and humans. All types of species have different strengths that help them adapt to their environment. Over the years, each species will adapt so that the traits that suit them best to their environments become stronger. In some ways, humans are actually stronger that chimps. A human being has a very strong bottom muscle which does not exist in a chimpanzee. The reason we have strong gluteal muscles is because these muscles are used to pull the leg back at the hip while running. On the other hand, chimps do not need two legs to run so this muscle is weak. 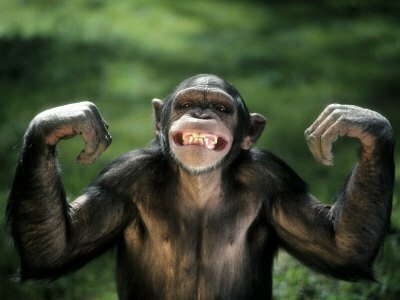 Chimpanzees have very strong upper bodies. In fact, their grip is especially strong. That is because they live in an environment that involves climbing lots of trees and swinging from tree to tree. They also use their upper bodies for walking. A chimp on four legs can easily outrun a world-class human sprinter. The chimpanzee’s skeletal structure has longer fibers compared to that of the human and can therefore generate double the total work output. In recent studies, genetics have identified loci to be the cause of some of the anatomical differences. For example, one gene called the MYH16 contributed to the growth and development of very huge jaw muscles in apes. In people, MYH16 has actually been deactivated. Most people have lost another muscle–related gene called ACTN3. Humans with two working versions of the gene are basically overrepresented among the elite sprinters while the nonworking versions are overrepresented among the endurance runners. On the other hand, chimps and other nonhuman primitives have only a working version.